Gulf Place Caribbean 310 - New updates, summer beach service! Book soon! BRAND NEW UPDATES! Be one of the first to enjoy the new 310! We have painted the entire condo, updated the kitchen and bathroom cabinets and installed a new HVAC! FREE BEACH SERVICE! - New for 2019 - Our summer guests will receive complimentary beach service! Enjoy 2 beach chairs and an umbrella during your stay on us! Experience an outstanding view of the stunning Gulf of Mexico from your own private balcony. Or take a relaxing stroll on the sugary, white sands of the most beautiful beaches in the world, located just steps away via private beach access. Your dream vacation destination is conveniently located next to the restaurants and designer boutiques of quaint Gulf Place Town Center. Our Gulf Place Caribbean condo has been beautifully updated. 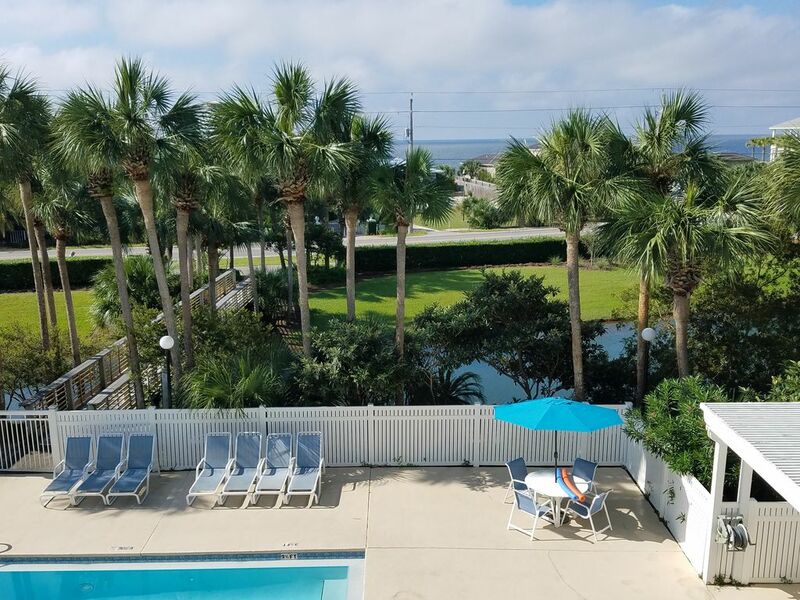 We have a great view of the Gulf, heated pool and private lake from the third floor. The spacious master bedroom features a king bed with fresh new bedding. Kids will love the twin bunk bed area that is tucked into the hallway. For extra sleeping space the new living room sofa pulls out into a queen sleeper that features a wonderfully comfortable memory foam mattress. You will find that the kitchen is fully equipped and is furnished with stainless steel appliances. You will love the convenience of having a washer and dryer in the unit. The HVAC is brand new as of January 2019 so you will enjoy your downtime in comfort. There is enough seating in the dining area for six. The deck is a great place to relax and enjoy the view. We have two Tommy Bahama backpack beach chairs with attached cooler for your days at the beach. There is so much to do without ever having to leave Gulf Place. The restaurants are wonderful and there are many activities like tennis and shuffleboard to keep you busy. We offer three swimming pools are two of them are heated in the cooler months for year-round enjoyment. This condo is the perfect getaway, no matter what time of year you visit! Thank you for visiting and please contact us if you have any questions. We have been traveling to Santa Rosa Beach for years. We love the area and are so happy to be able to share our place with you. We love the beautiful uncrowded white sand beaches and small community feel of Santa Rosa Beach. Gulf Place has the best amenities in the area. You can spend the day at the beach or pool, play tennis and shuffleboard and go to shops and restaurants without ever getting in a car. We own and manage the property ourselves. If you call or email you will reach us directly. We pride ourselves in our responsiveness and believe we offer a great value for a wonderful vacation. Beach towels are provided during your stay. Beautifully decorated third floor unit with private balcony, view of Gulf of Mexico; two flat-panel TVs. Built-in hallway bunk area, King bed in bedroom, three swimming pools, two hot tubs, tennis courts, private beach access. No smoking and no pets. We love the view from our balcony. It was a convenient location with great walking paths. Hot dogs and cold drinks at Tom Thumb. Beautiful, clean beach! Our stay in Gulf Place 310 was fantastic. It was a much needed spur of the minute trip. We loved spending rare time with our grown adult children. Our lives are so hectic with many job demands and living in different cities is tough. The condo and Gulf Place was the prefect back drop to fun relaxation and a birthday celebration for myself. The condo was clean loved the décor and the location was prefect with a beach and pool view. Morning coffee just tastes better on a balcony by a palm tree !! The owners were pleasant and communicated quickly. The grounds staff were very friendly and worked hard to keep the building looking fresh .Every one at Gulf Place from the staff to the shop keepers to other guests were very welcoming, Thanks for a great week !! The property was freshly painted and has new cupboards in the kitchen. It was very clean upon check-in. Great location close to beach, biking, beanbags and just bumming. Pros: Gulf Place is a great location - just walk across 30A and you're at the beach, no more than 5 minutes. Great restaurants in the complex, too. Owners were very easy to work with and provided info ahead of time. No problems with unit while we were there. Cons: unit needs a lot of updating and definitely a new master mattress. We've stayed at three other units in the complex that were more updated than this one. But, for a last minute reservation and just three nights, this rental was ok for us. Thank you for your comments. The mattress is on the firm side and is in good condition. We are sorry you didn't find it to be comfortable. We will be making some updates to the condo in the off season. We do recognize that there are more updated condos, but our rates reflect this. We believe that our condo is the best value in Gulf Place. We loved our stay! I highly recommend!!! Thank you so much for taking the time to write a review! We are so glad you enjoyed your stay! Great experience, the place is absolutely beautiful! They have everything you need, is like your own house. Laura is always very quick to respond if we need something. Thank you so much for your kind words! We are so glad you enjoyed it and hope you come back!